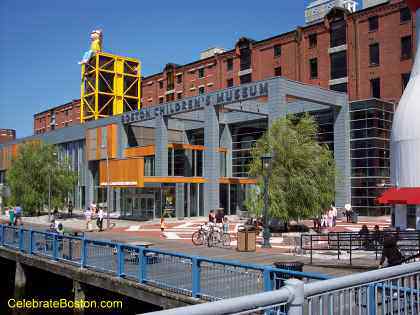 For Boston area school children, the Children's Museum has been an extremely popular "field trip" destination for generations. The museum is dedicated to providing interactive educational exhibits. Some of the exhibits at the Children's Museum include: Art Studio (craft workshop), Boats Afloat (simulated water environments), Construction Zone (build small structures), KidStage (introduction to the performing arts), Science Playground (rotating science exhibits), and We're Still Here (Native American house and artifacts). Please refer to the museum's website for a complete list of exhibits. The Children's Museum is a great place for primary and middle school children to learn from interactive exhibits, and also have fun. Walking Directions: Exit the station in front of an H shaped white 40-story building. Walk behind the building to Dorchester Avenue, and left along the waterfront to the next bridge at Congress Street. Walk across the bridge and the museum is on the left. There is a 40-foot milk bottle in front of the building.